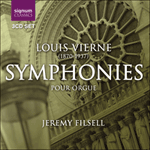 The Cinquième Symphonie in A minor, Opus 47 (1924] marks the progress of Vierne's musical language into the modern post-Great War world of increasing dissonance and atonality. Thus the final two Symphonies adopt a thornier, more challenging tonal language and are longer but still masterful in their use of cyclic technique. Written after the series of great catastrophes not only in Vierne's personal life but also within old Europe, the impression of a highly developed musical expression and refinement of language is palpable—one where much of the outwardly exuberant and Romantic utterance of the previous symphonies is forsaken. In the Fifth Symphony, Vierne builds an edifice on the basis of two themes, one a series of descending diatonic thirds [A] and the second [B], an ascending and then descending chromatic sequence. Both are heard alternately within the opening bars of the Grave—brooding and anguished music with echoes of the Wagner of Tristan in the following Allegro (Allegretto molto marcato), the main diatonic theme [A] is inverted and accompanied by the chromatic second theme [B]. Not dissimilar lo the rhythmic shapes of the Fourth Symphony's Allegro movement, it is harmonically more advanced, significantly longer and more involved developmentally. In the scherzo, the two themes are worked very clearly. As with lhe scherzo of lhe Sixième Symphonie, it adopts a macabre and spectral character and their proximity in the melodic and rhythmic language to Paul Dukas' evergreen 'Sorcerer's Apprentice' is striking. The scherzo's two episodes each adopt a respective cyclic theme. The Larghetto is expressive, graceful and woven principally from the chromatic second theme [B] and an inverted version of the first [A]. The Finale signals a triumphant carillon in the tonic major key. The chromatic second theme [B] places its ascending and descending phrases in reverse order. 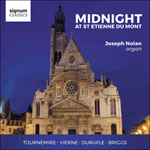 The elaborate developments are extensive but texturally economical (the clarity of Vierne's counterpoint is never compromised by chordal bombast) and the diminution of rhythmic ideas in the final pages provides a cumulative effect, driving the intensity of this long movement to its dynamic, virtuosic—and strangely unexpected—conclusion.